When Githinji Mbire moved into his new gallery space a few months ago, he knew there would be some challenges. The tiny Oakland storefront is only two hundred square feet in size and is located on a quiet section of 15th Street, between Webster and Harrison streets. Mbire, a longtime Oakland resident and artist, lives nearby and was well aware that this particular block, which ends at Harrison, doesn't get much foot traffic and sometimes attracts crime and trash. "People avoid it here. It's dark and not very safe," he said. Since he began renting the space, however, that has started to change. And it helps that he's got a lot of company. Mbire — whose gallery, Omiiroo Gallery, is located at 329 15th Street — is just one of eight or so artists who have set up shop on this single block during the last six months. This revitalized street appears to be breathing life into the local economy of downtown with creative entrepreneurs filling vacant spaces and attracting new visitors to the neighborhood. Since late last year, three new art and retail venues have opened their doors on 15th — and two more are scheduled to launch next month. "This will be the cleanest street in Oakland," said Mbire, noting that he now regularly sweeps the sidewalk outside his store. 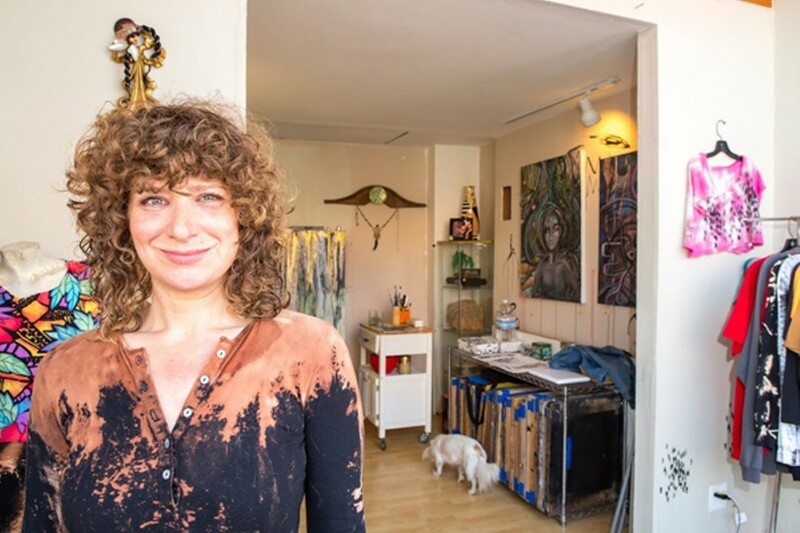 A few doors down from Omiiroo Gallery, West Oakland resident Judy Elkan runs Mary Weather (333 15th Street), a clothing shop and art gallery that she opened in January. Elkan's shop is adjacent to Naming Gallery (335 15th Street), an art and performance space that began putting on shows last fall and was the first gallery on the block. A new vintage retail space called Tilde (349 15th Street) is in the works next to Naming Gallery, with an opening scheduled for July. And on the opposite side of 15th, there are two new live-work gallery spaces that are both run by couples: SideQuest Gallery (314 15th Street), which has been open for two months, and Third Eye Studio and Gallery (304 15th Street), which will launch in July. 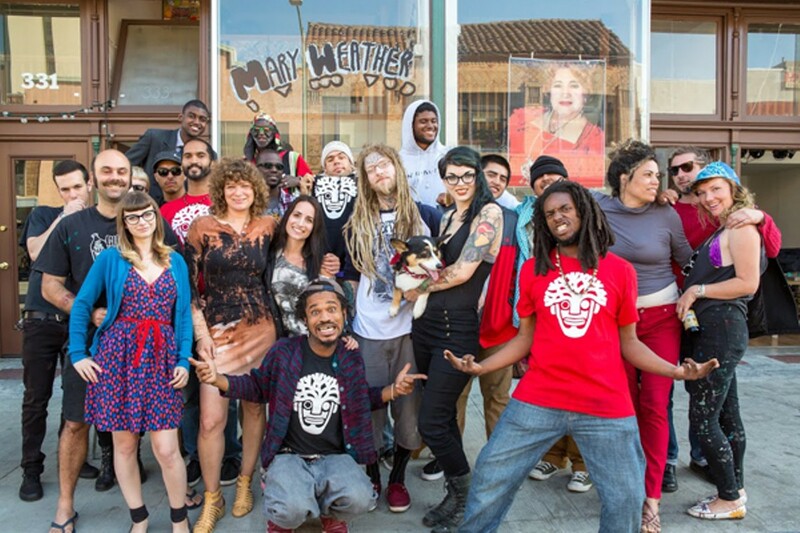 "We've taken a street that was dead and scary and created something where people could spend a whole afternoon hanging out on this block," said Elkan, owner and designer of Mary Weather. In addition to hand-printing T-shirts in her gallery, Elkan hosts weekly open mic events and regular art shows. "The vibe we have is just perfect. It's creative and it's open and we all have our own flavor and a unique perspective and voice. We're like this little mecca .... 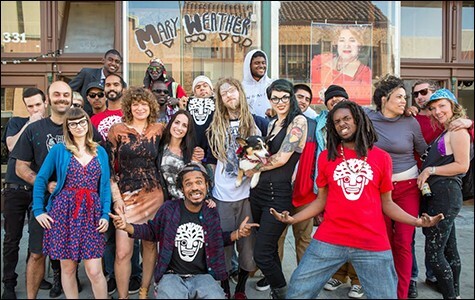 I hadn't yet found this type of community in Oakland." The locally owned shops on the block generally have similar business models, with creative retail components helping support their artistic endeavors. Elkan, for example, sells her apparel online and does custom prints for people in person. As they work to get their businesses off the ground, the shop owners say that, in recent months, they've seen an increase in traffic on the block and in the surrounding area, which is home to about five additional art-oriented venues in a roughly two-block radius. That means new revenue and increased attention to the creative economy of downtown. Some say this kind of change is clearly needed. Over the last decade, 15th Street between Webster and Harrison has been plagued by empty and boarded-up storefronts and high business turnover. Anchoring this corridor is the historic White Building, a three-story landmark structure that was built in 1924 and extends about half the block; it currently houses Omiiroo, Mary Weather, Naming Gallery, Tilde, and a number of other small businesses. When husband-and-wife Saied and Vida Karamooz purchased the property in September 2012, about half of the ground-floor retail and office spaces were vacant, according to Saied. Now, both the commercial and office spaces are all filled. And the proliferation of art venues on the ground floor was not an accident. "We had intended to attract artists or creative minds," Saied said, adding that the demand is high enough that he has developed a waitlist. "If we had more space, we could've rented more." The impact of the new storefronts is tangible, he continued: "When we first purchased it, throughout the day there would be nothing going on here, literally .... Now, you'll see a very high volume of foot traffic and you can sense that there's activity here." Moving forward, if vacancies arise, he plans to prioritize creative tenants over professional services. "I remember seeing this street seven years ago — boarded up from Harrison to Webster," said Josef Lucas, head curator at Naming Gallery. Because the location doesn't naturally attract high pedestrian or vehicle traffic, the commercial rents have remained low enough for artists to afford. "It's not prime real estate ... and that means there's less pressure on us to make crazy money to pay rent," Lucas said. "It just felt right," said Markuss Decker, a tattoo artist and sculptor who is in the process of launching Third Eye Studio and Gallery with his girlfriend Andrea Lesica, a multimedia artist. "We are all on the same page about livening up the space," Decker said. In cities like Oakland, there are often concerns that an influx of artists to a neighborhood can be one of the first steps toward gentrification: Artists make areas more attractive to outsiders, prompting landlords to eventually raise rents and price out lower-income, longtime residents. But the gallery owners emphasized that this quiet strip has suffered from inactivity — and that their venues aim to be inclusive and accessible. "We're not displacing anybody," Lucas said. "This was a forgotten neighborhood. Now, we're bringing some light back to it." "It creates a certain standard of living, but one that includes everybody," said Mbire, noting that he leaves his door open when he's working in the space. "Anyone can come in and sit down. I encourage people to come here — not to spend money, but to come and look at artwork." At Omiiroo, Mbire plans to sell locally produced food and drink items — like coffee, honey, and hot sauces — to help him make ends meet. "Nobody is making any money yet. We are all just investing at this point," said Lisa Aurora Calderón, who co-owns Naming Gallery and owns Tilde, the retail shop next door. There are a lot of opportunities for collaboration between the venues and coordinating events, she added. "We can take over part of the street on the weekend and it becomes an outside public space." In April, some of the 15th Street galleries and surrounding art venues helped produce the inaugural Oakland Drops Beats Music Crawl, a music festival spread across downtown venues and outdoor stages (see "More Stages for East Bay Bands," April 15). By some measures, the development of this new 15th Street art scene parallels the origins of Oakland Art Murmur, the monthly art walk that began in 2006 with a handful of venues in the Uptown neighborhood. That event quickly expanded to include dozens of galleries and eventually led to the creation of First Fridays, the massive street festival that brings thousands of people to Oakland every month and offers a substantial boost to neighborhood restaurants and bars. In recent years, some Uptown galleries have lamented the fact that the monthly event is more of an unwieldy street party than a celebration of local art. And it is these frustrations that have in part inspired the entrepreneurs at 15th Street to build an art scene that they say is distinct from the chaos of First Fridays. In fact, the new galleries have a loosely organized Second Saturdays schedule, which is likely to become more formalized in the coming months. "We are trying to put the art back in the party," said Lucas. "We're not trying to throw a party and show some art." Lucas was an early participant in Art Murmur and has seen firsthand its dramatic expansion and evolution. At this point, the smaller-scale events on 15th Street will be better suited for some artists and for audiences, he said. "As a curator, I understand the crucial value of people seeing the art and getting to experience it. We can set up a situation where we can have people come in and experience local music and meet the artists. It's about their work." Like their neighbors, Kelsey Burt and her fiancé, Casey Fay — who run SideQuest, the live-work gallery across the street from the White Building — prefer to avoid First Fridays. "We don't want to compete with that. We want to keep it very local and tiny," said Burt. Since it's a live-work space — they live in a studio apartment above the ground-level gallery — it's fairly easy to keep costs down. This allows them to better support the artists who sell work at SideQuest, she said. They only take a 10-percent cut of sales, while other art galleries typically take 50 percent or more. And because it's their own space, they can take risks, said Fay, noting that they recently painted the walls of the gallery blue for an ocean-themed show. Entering the small space felt like going under water. "I have the freedom to do different things than just hang art on the wall," he said. For at least one longtime neighborhood tenant, the influx of galleries and shops is welcome. Ricky Ramirez, who has run Ricky's Tribune Barber Shop on 15th Street for thirteen years, said he is glad to see increased activity on the street and is happy with his new neighbors. "They are very nice people," said the 79-year-old Ramirez, who has been a barber in downtown Oakland for more than five decades. "We've got to have more traffic here. That's all you need."